Patients at The Children’s Center Rehabilitation Hospital celebrated prom recently. 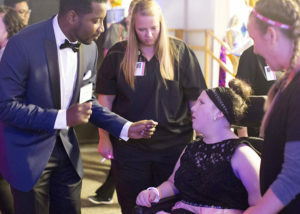 Celebrity guests, including University of Oklahoma football player Ogbo Okoronkwo, local media personalities, and high school students from Carl Albert High School and Southeast High School escorted patients to the dance. Carl Albert 2017 graduate Courtney Wages attended the event for the first time. Patient, Victoria, dancing with her prom date. The theme of this year’s prom was “Out of This World.” Prom gives patients a chance to enjoy the same school activities their peers get to experience. During the dance, a prom king and queen were crowned. Families were on hand to take photos of their children in their prom dresses and tuxedos. Eighteen-year-old Victoria Salcedo from Eufaula attended the prom. She was diagnosed at three years of age with a craniopharyngioma, which is a non-cancerous tumor. “Victoria turned 18 in April. She missed her prom because she was in the hospital for rehabilitation. It’s a blessing she was able to attend the prom,” said Joy Salcedo, Victoria’s mother.